This massive 39mm. 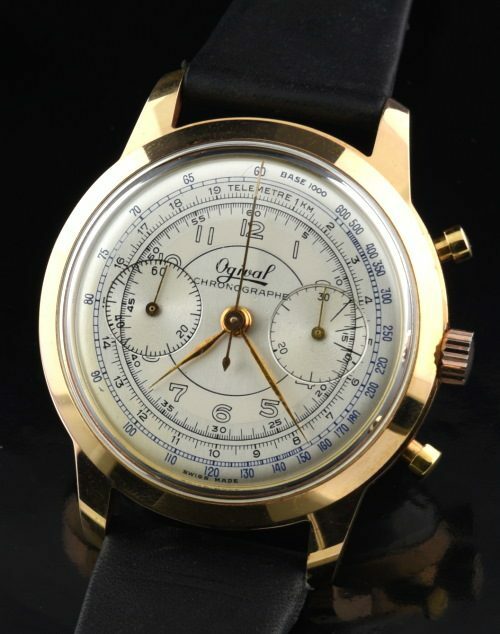 OGIVAL vintage 1950’s chronograph is absolutely stunning! This two-tone dial does not appear as amazing in my photos as it does in person. The fields alternate light to darker when turned on an angle. The gold handset is original. Look at the fine detail on this amazing ORIGINAL dial! The heavily gold plated case with steel back displays incredible-almost new condition. It is very uncommon to find such a large cased chronograph. The manual winding VEnus 188 SWISS chronograph movement was just meticulously cleaned and is accurate. All functions operate perfectly. Always start and stop the chronograph with the top button. Only reset with the bottom button when you have STOPPED the chronograph first. This watch is a gem and won’t last long!